PIGEON FORGE, Tenn. – I whine and moan about places like Virginia Beach and Ocean City because I believe if you’re going to walk on the tacky side, you should cross all the way over. Jackson Hole didn’t quite get it. Wisconsin Dells really, really did. If you like your flashing lights and your nearly unbearable kitsch with a side of Bible, try Pigeon Forge on for size. 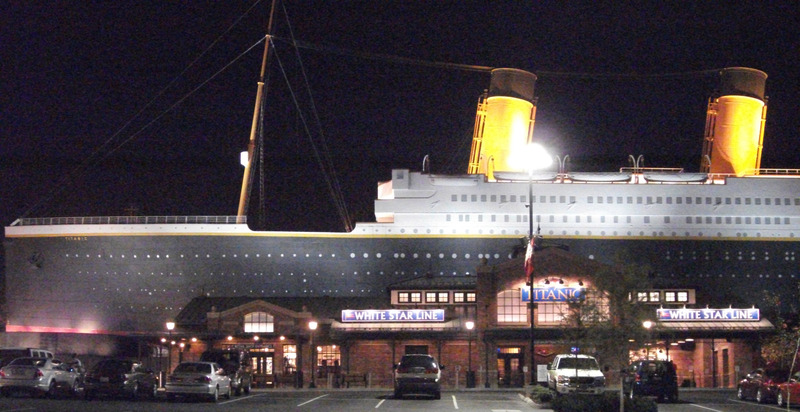 We knew we were in for something special when we came across a museum shaped like the Titanic – but that was just the tip of the iceberg. It was full dark, and by that, I mean the sun had gone down. It’s just like midday 24/7 in Pigeon Forge. Joseph and the Technicolor Dreamcoat was on at the Miracle Theatre. A Scriptures-themed hotel offered camel rides. A warehouse with a two-storey sign advertising a Bible sale was still open. “It’s Wisconsin Dells on Bible crack,” Melani said. The cowboy outlet (because everyone needs a cowboy) was also still open. It was nearly 11 p.m. So was the As Seen on TV store. There were lit-up waterslides and rides and miniputts. Imagine miles and miles of this during a rod run. Then we started to notice the classic cars. One was cool. Two was really neat. Then there were five or six and then dozens, parked in lots along the street, facing the road. Some had their hoods open. Some were for sale or trade. Owners sat on the grassy median in folding chairs, like a tailgate party without the tailgate. What turned out to be early comers for a Grand Rod Run went on for miles and miles – there were hundreds of classic cars along our cruising lane. There was just too much to look at, especially through our travellers’ exhaustion. We passed a flashing neon Jesus sign o our way to the Quality Inn. Inside the most luxurious room of our trip (at a whopping $68, tax in, for fireplace, fridge and microwave and Jacuzzi tub), Candi the housekeeper had left the Bible open to a Psalm wherein God was very, very angry. Maybe he was just fed up with all the lights. Oh my God. Natural light.